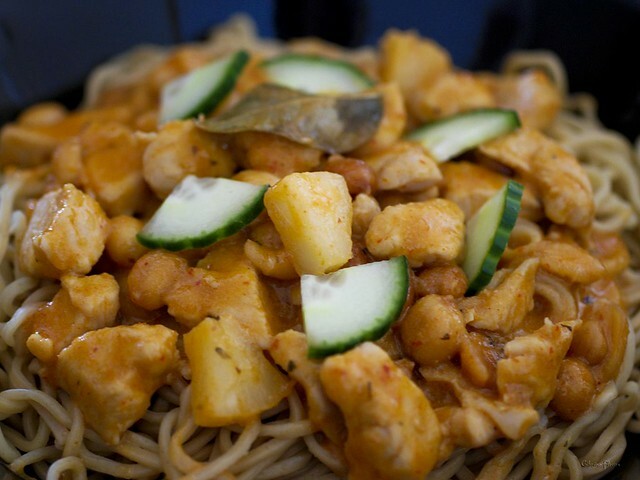 Panang curry with chicken, peanuts and pineapple | SMØRGÅSBORD! Heat oil in a wok or large frying pan. Saute the onion together with the curry paste for around 2 minutes. Stir in the coconut milk. Bring to a boil. Add the chicken pieces and the kaffir lime leaves. Lower the heat and allow to simmer for 15 minutes. Using a slotted spoon, take the chicken out and let the remaining sauce simmer for a further 5 minutes, or until it has reduced or turned a little thicker in consistency. Put the chicken pieces back into the wok. Stir in the coconut cream, fish sauce, lime juice and brown sugar. Let everything simmer for a further 5 minutes. Finally, add the peanuts, pineapple and basil. Simmer for another 5 minutes.